Digestive, antispasmodic, antibacterial, antifungal, diuretic, stimulant. It regulates menstruation and relieves from its pains. We make infusion or decoction from the roots or the seeds. We drink 1 – 2 cups a day after meals. Its use should be interrupted every 2 weeks. Diuretic, tranquilizer, hair tonic, astringent. It helps intestine function and it's against renal lithiasis, cholelithiasis, gravel, nephritis, arthritis. We eat it. We can use the slices or pulp or porridge for skin and hair care. 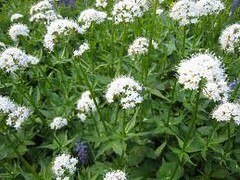 It reduces cholesterol and triglycerides, it's against arteriosclerosis, rheumatism and liver disease, it's blood purifying. We boil the roots with white wine and we drink. 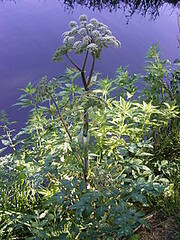 For rheumatism and neuralgia treatment we can use the tincture or the extract of artichoke. The decoction from leaves or stalks can be used for gargles against tonsillitis. For liver disease treatment we can drink 3 cups of decoction per day. The extract should be used on a doctor's prescription and the tincture in a dosage of 6-9 gr, 3 times a day. The tisane from common couch is a medicine known worldwide as emollient, refreshing, diuretic and inflammatory especially for intermittent fever, gastrointestinal infections, urinary tracts infections, liver and kidney colic. We can make alcohol of an excellent quality by fermenting or distilling the roots. Any proportion is harmless. We can drink the extract, the decoction (20-30 gr in 1 litre of water + a little honey), the juice (from 30-100 gr of young leaves and stalks). We can also let 2 spoonfuls of sliced root soak for a while in 1 litre of water, then we boil for 10 mins and drink 1 glass per day. 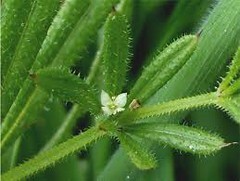 Antitussive, expectorant, demulcent in case of dry cough and respiratory infections, it cures dandruff and hair loss. For respiratory infections we can drink the infusion. For dandruff treatment we can massage hair roots with cold decoction every day for 2 weeks. Antitussive, emollient, inflammatory. It relieves muscular pains, effaces bruises, mellows aposthimas, combats gingivitis, mouth ulcers and constipation. It's very effective against stomatitis, pharyngitis, stomach and intestine ulcer. We drink the decoction from leaves and flowers against infections and cough (3 cups a day). We can also add decoction in bath water against skin irritations, we can gargle decoction against gingivitis, mouth ulcers, tooth aposthimas. For a more drastic decoction: we boil 100 gr of root in 10 cups of water, let evaporate to its half and filtrate. We use it against internal infections as well as externally against bruises and muscular pains (we spread it on the skin). 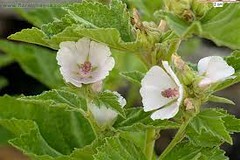 We can take a sachet of marsh mallow root powder dissolved in a little water every day against constipation. Aromatic, stimulative, laxative, apetizing and digestive in small dosage, emollient and vulnerary. The yellow bitter juice that flows from leaves when we cut them can be dried and used as a laxative. The leaves themselves when cut and peeled off their membrane can be placed on skin burns, insect bites, cuts. They have an antifungal, antibiotic and inflammatory effect. 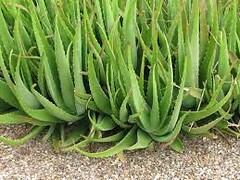 Aloe is extensively used in cosmetics industry. Diuretic,digestive, against colics, vomit, stomach disorders. 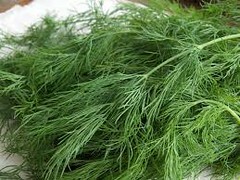 For decoction we boil 2 tea spoonfuls of dill seeds in 1 litre of water for 10-15 mins. We drink half a cup once or twice a day. Against wheeziness, gout, rheumatism. It's a good digestive, tonic. 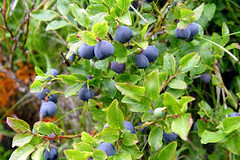 Massage with the juice or tincture from fruits relieves from joint pains. Eating the fruits helps with indigestion and burning them helps with respiratory problems. It also decontaminates the air in closed spaces. Diaphoretic, febrifuge, hemostatic, inflammatory, menstruation regulating, heart stimulative, anti-rheumatism. Against colitis, gastrointestinal diseases, diabetes at its start. We drink 3 cups of infusion for quite a long period. 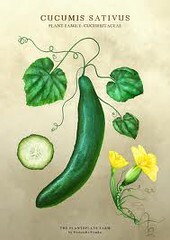 We can use the infusion in dressings on the skin, massaging the hair, in a steam bath for the skin greasiness decrease. Inhaling infusion vapour helps with respiratory problems. Sedative in case of nervous tension, insomnia and stress. 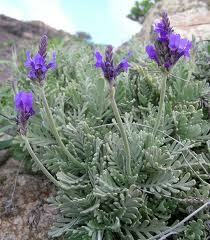 Antispasmodic, headache relieving, reduces high blood pressure, calms down hysteria, cough and asthma. It must be used for one week only then interrupted for 2-3 weeks. We can use the decoction or the maceration from the roots, we drink 2-3 cups a day. Tincture: 5-10 drops in some water. Small doses of decoction or maceration relieve from headaches, calm the nervous system and fight insomnia. Known as “the” herb for healing wounds. It is considered to be very effective for neuralgia, depression, thrombosis, rheumatism, diarrhea, it's a good hemostatic, spasm soothing, revitalising. The essence works wonders in healing wounds, burns, bruises, bites, skin eruptions. We massage or spread. For all the above problems we can also apply chopped leaves poultice on the skin. The herb infusion in alcohol as well as the distillate (eau-de-vie-rouge) are widely used. A cup of warm decoction every morning is really beneficial. Stimulative, tonic, antispasmodic, antiseptic, expectorant, against dizziness and migraine. It can be dried and pulverized. We can drink the infusion, we can use the tincture from fresh leaves: mixed with wine it becomes a good tonic, mixed with oil it is against constipation, a few drops of tincture act against headaches. 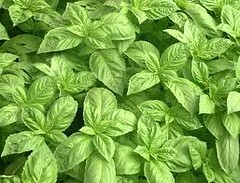 Basil powder will help sneezing thus curing rhinitis. Diuretic, anti - diabetic, anti - diarrheal. 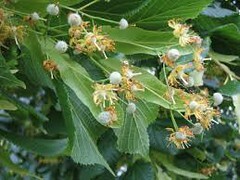 The infusion or decoction from leaves, boiled with a little honey or vinegar, can be used for gargles against pharyngitis, sore throat, gingivitis, mouth ulcers. It will facilitate birth (1 cup per day from 6th month of pregnancy). The sirup from fruit is an excellent anti - diarrheal (we boil bramble juice with double quantity of sugar until it thickens). Carnation oil is a strong antiseptic, it ceases toothache, aborts vomit and nausea. It's an effective digestive, antispasmodic, anti cancer. 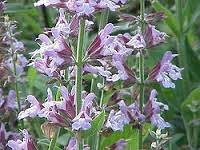 We use carnation oil or decoction for wounds, insect bites, toothache. For nausea we can drink some water with a few drops of carnation oil. Alcoholic drinks with a few drops of carnation oil become good tonics. 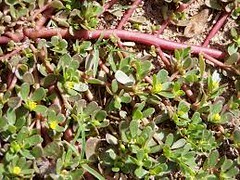 The whole plant is useful except for its roots. It's sedative, diuretic, against biliary stones, colitis and amoebas. The juice can be used against biliary stones. Daily consumption of the plant in salads helps curing colitis and amoebas. Diuretic, apetizing, digestive, expectorant, antispasmodic, emmenagogue. The oil extracted from seeds can be used slightly diluted. It's a very effective expectorant and lice and other parasites repellent. We can also use the decoction, infusion, maceration and tincture. We make anise maceration by soaking seeds in water for a few hours, then we can take a tea spoonful 3 times per day. 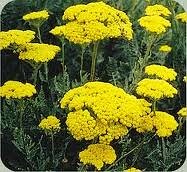 Tonic, antispasmodic, emmenagogue, vulnerary, antiseptic, anti rheumatism, headache killer, carminative, helps with indigestion. We should be careful with rosemary consumption as in big quantities it might be poisonous. 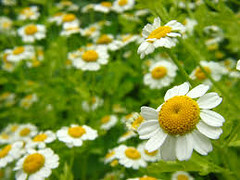 The flowers and leaves are very effective against asthma, flu and pertussis. Poultices and washings are good for the skin. 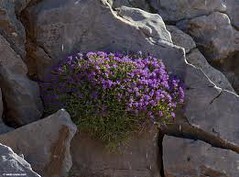 Rosemary in wine is a good heart stimulant, boiled with wine helps people suffering from insomnia. 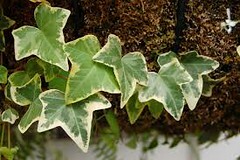 Powder from leaves heals skin wounds, the essence is moth repellent. The decoction can be used for healing gangrene ulcers (we put it on ulcers), rheumatism and swellings (we massage aching parts with it). Rosemary tea prevents fainting. 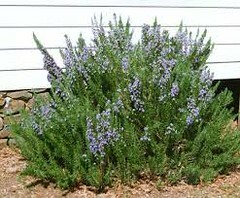 Rosemary flowers clobbered with sugar until they become a paste help with dizziness. Rosemary fresh leaves put on an abscess make it ripen quickly. A piece of cotton wet with rosemary juice and put in the ear will relieve earache. 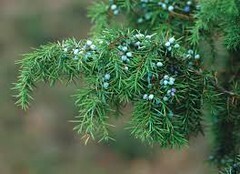 For bruises, wounds, skin eruptions we can use rosemary ointment whereas gargles with infusion will heal mouth ulcers. Tonic, stimulant, antispasmodic, vulnerary, sedative, diuretic, it fights amoebas. We can use the decoction or infusion (we drink 2 cups a day). Poultices help heal wounds, ulcers, abscesses. Chewing leaves relieves toothache and headache. 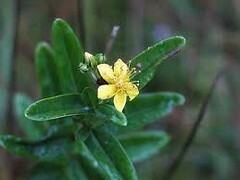 Tonic, stimulant, antispasmodic, diuretic, diaphoretic, against indigestion, vomit, tachycardia, urinary retention, vertigo. Washings or poultices are good for skin diseases, the dressings relieve headache. 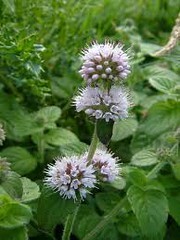 Spearmint tea prevents vomit, spasms, cramps, colics (1 tea spoonful every so often). 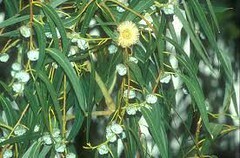 Eucalyptus oil is antiseptic, antispasmodic, febrifuge, disinfectant, deodorant, insect killer, vulnerary. 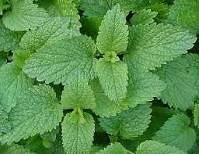 It is used for curing respiratory inflammations, cough, asthma, sorethroat. 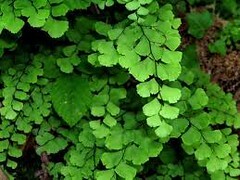 The leaves have antibiotic properties and can be used for decoction making and steam inhaling. 5-10 drops of eucalyptus oil for chest massage or in boiling water for steam inhalation. We can also boil eucalyptus leaves and inhale the steam which helps get rid of colds. A hot bath with boiled leaves added in the water will also relieve from cold symptoms. We can drink decoction or infusion. The seeds are nutritional, they calm down the nervous system, prevent bile and kidney stone formation, arthritis. They improve vision. 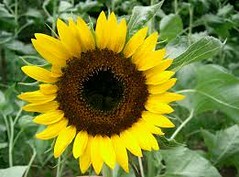 Sunflower oil extracted under cold seed pressure reduces cholesterol and protects from arteriosclerosis. We eat the seeds and the oil. 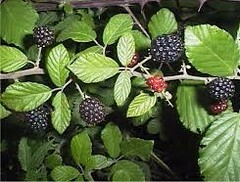 Appetizing, diuretic, blood purifying, beneficial to the liver, antibiotic. It can be eaten as a salad. Its juice mixed with honey is a curing ointment for face freckles. Against whooping cough, thrombosis, rhinitis, scurf, scabies, psoriasis and other skin diseases. The tincture can be used against rhinitis and whooping cough (10-20 drops per day) the leaves in poultices and the ointment are beneficial for joint pains and skin diseases. Digestive, antispasmodic, carminative, intestine regulating, against headaches. We can take seed decoction and infusion as a digestive and carminative. Attention! big quantities of coriander juice might cause drunkenness! Vulnerary, hypotensive, antispasmodic, inflammatory, anti rheumatism, blood purifier, lithotriptic, against bladder diseases and incontinence. We can boil the fresh leaves and plant sprouts and eat them as a salad. 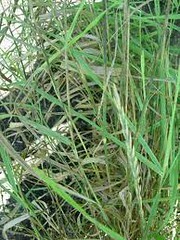 Also, wine and tincture can be produced from grosgrass ( the tincture helps with rheumatism). 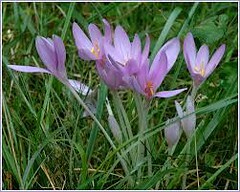 Despite the fact that the plant is dangerous because of its toxicity, meadow saffron is precious when used suitably. It's considered a classical medicine against acute gouty arthritis, an effective analgesic (in small dosage it is used against toothache too). Meadow saffron shouldn't be used in cases of renal insufficiency. 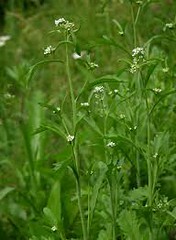 We can use the tincture from seeds (1-5 gr within 24 hours) and the extract but always according to a doctor's advice. 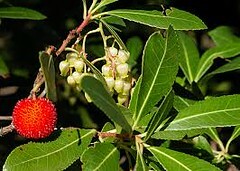 Strawberry tree leaves have antiseptic, diuretic, inflammatory and hemostatic properties. Ripened fruit help a lot with constipation. The decoction from leaves is very effective for the cure of flu especially if it is mixed with honey and cinnamon. We can also use it for massage to lower fever. Emmenagogue, sedative, antispasmodic, tonic, digestive, diuretic. We can use the sirup (very effective when massaged on gums, it relieves teething pains) and the infusion. Caution! In big dosage (a few grams!) it might be toxic and cause bleeding. One of the most effective “medicines” for burns and insect bites. An excellent anti microbe, it exterminates streptococcus and pneumococcus. It's tonic, antispasmodic, stimulant, calming, light sedative, vulnerary, against cough, asthma, flu, laryngitis and headaches. We use the infusion, the tincture from fresh flowers for massaging aching parts of the body or skin. We can use dried flowers to repel insects from drawers and wardrobes. Massage with the plant extract relieves from headache, cures bruises and swellings. Digestive, against nausea, sedative, nervine. 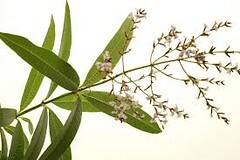 We drink infusion from aloysia with honey or sugar. We can also season our food with dried flowers or leaves. Diuretic, liver detoxifier, antispasmodic, stimulant, tonic, appetizing, expectorant. It's against eczema, other skin diseases, edema, indigestion. It's got a beneficial action to blood circulation and rheumatism cure. 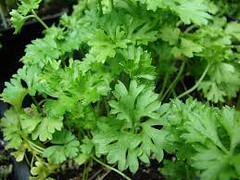 We can drink a wine glass of parsley decoction every morning before eating but not for over 3 consecutive days. For more intensive use it's better to drink the infusion. 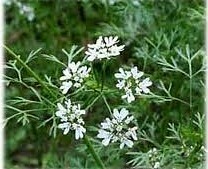 We can also use the juice from parsley or the decoction from the seeds or poultices with boiled leaves for the cure of skin diseases, insect bites. Digestive, sedative, stomachache relieving, expectorant, anti diabetes, vulnerary, helps with colds, asthma, tonsillitis, bronchitis. We can drink the decoction (2-3 cups a day), the infusion, the tincture (3-4 drops in a teaspoonful of honey, 2-3 times a day). We can inhale hot decoction steam to help us with cough. Dressings wet with decoction as well as massage with the essence are an excellent vulnerary. The seeds can be used in cooking. Tonic, apetizing, digestive, diuretic, analgesic, expectorant, sedative, helps digest fat so it helps in losing weight. We use the leaves infusion as a good digestive, the seed decoction boiled with red wine (2 teaspoonfuls of seeds in ½ litre of wine) is an excellent tonic and appetizing. Chewing seeds prevents the flu. 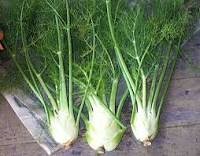 Massage with fennel oil helps reduce edemas. Digestive, antispasmodic, anxiolytic, stimulant, tonic, antacid, against indigestion, toothache, it brings longevity. 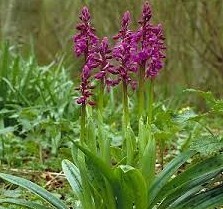 We can use poultices against joint pains, massage with juice against headaches, the tea in bath water calms down nerves. We can drink hot infusion or decoction with lemon against colds (2-3 cups a day). The essence is used as a digestive, antispasmodic and sedative ( a few drops in some water). The herb is also used for making the drink “Eau de melisse des Carnes” ( flower sprouts of balm with lemon skin, cinnamon, gloves, nutmeg and coriander soaked in strong white wine). 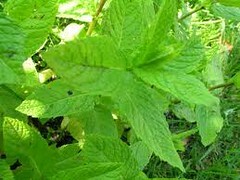 Demulcent, expectorant, laxative, it heals insect bites and itching. We use the decoction from leaves in poultices or dressings for the cure of skin eruptions, calluses. Gargles with infusion helps with throat irritations and mouth ulcers. When we drink it it's a good expectorant, it helps cure urinary and stomach diseases( 2-3 glasses per day). We can also drink decoction from the herb roots or flowers (several cups a day). Antispasmodic, sedative, analgesic, against incontinence, constipation, colics, nausea, dizziness, whooping cough. 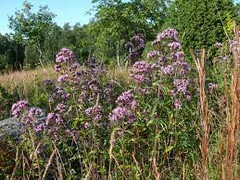 It is used in various forms such as extract, tincture, powder, pills, suppositories but only on a doctor's prescription as, apart from being an effective medicine, it's also extremely poisonous. Astringent, disinfectant, anticatarrhal, against diarrhea, common cold, throat infections. We can drink the decoction for colds and throat infections. The fruit (10-25 dried or fresh fruit or jam or juice or sirup or compote) are very effective against diarrhea, they are an excellent astringent and disinfectant for the intestine. Tonic, apetizing, digestive, antispasmodic, antiseptic, diuretic, astringent. The decoction is a very effective antiseptic, diuretic, antispasmodic. The infusion is a good expectorant. 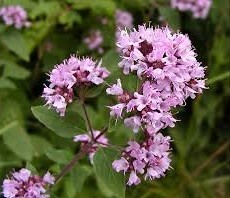 We can use oregano oil for massaging aching parts of the body and for healing wounds. 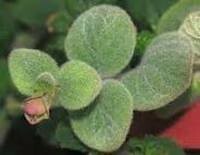 Chewing oregano can relieve from toothache. We drink tea, we eat jelly, they both are very nutritional and beneficial to convalescent people. The decoction is an excellent demulcent, very effective against diarrhea and throat irritation. 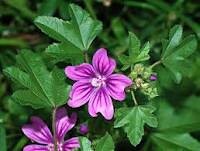 Astringent, sedative, tonic, antidiarrheal, digestive, it helps blood circulation and moderates nervous irritations. We drink tea (“greek tea”), infusion to cure nervousness, vertigo, depression. Infusion gargles help cure throat infections, pharyngitis, mouth ulcers. When used in steam baths it's refreshing and it tranquilizes skin irritations. As it causes warming up, it should be avoided by people who suffer from high blood pressure. Antitussive, antispasmodic, sedative, slightly hypnotic, against constipation, indigestion, migraine. We drink the decoction or infusion from leaves and flowers or plant bark (2-3 cups per day). The decoction is also used externally as a hair tonifier, anti wrinkle and freckle. A bath with decoction helps us calm down. Carminative, anti diarrheal, expectorant, anti rheumatism, anti vomit. Against vertigo and migraines. We drink decoction (2-3 cups a day), we massage with essence to cure migraines and vertigo. The leaves extract is a good anti diarrheal. The juice mixed with vinegar is a good anti vomit. Worldwide known for its sedative and antiseptic properties. 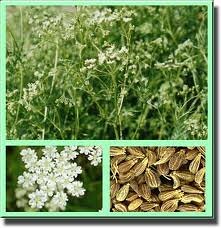 It's very effective for migraines, anti rheumatism, stimulates blood flow, helps cure colds and allergies. We can drink the decoction (2-3 cups a day) or spread it on our skin to cure itching and irritation. We can gargle it as an effective mouth antiseptic. The infusion added in bath water helps us relax. Also the essence is an effective sedative and tranquilizer.